We've discussed some recommendations for gun safes previously but only touch some of the accessories that will keep your safe in good working order and add functionality to your secure weapon storage. Besides an opportunity to store your valuable firearms for easy retrieval in an emergency, the accessories add personality and organize your weapon collection exactly the way you want. There are many products on the market to help you create your ultimate gun safe ranging from dehumidifiers, storage organizers, alarms, and lighting systems but we`ll be reviewing six of the most common categories of accessories. Excessive humidity remains one of the biggest enemies of you stored valuable collections since it can ruin your guns. This means you need an accessory to keep the moisture out of the safe. Without question, one of the must-have items for every gun safe owner is some type of dehumidifier. Depending on where you live, the size of the safe, and where you keep it, you should consider using an appropriate desiccant or gun safe dehumidifier. If you keep a gun safe in a garage or a basement or live in an area with high relative humidity, then an electric dehumidifier that slightly heats the air inside the vault will work best. For moderately dry climates, a rechargeable dehumidifier such as the Stack-On and Eva-Dry typically work best. 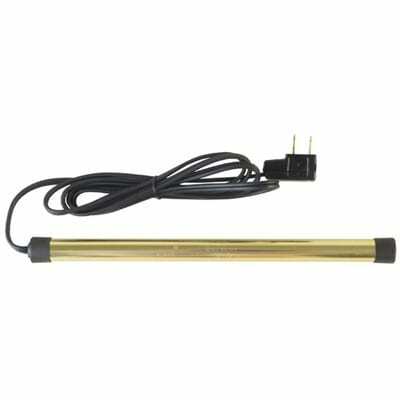 While the rechargeable mini dehumidifiers need to be recharged every few weeks, powered or wired dehumidifier rods like the GoldenRod Original Dehumidifier are very effective at keeping the moisture at low levels without any maintenance. The GoldenRod dehumidifier prevents dew point conditions by keeping the temperature consistent inside the safe, which is a few degrees higher than the ambient temperature of the room. The Lockdown GoldenRod dehumidifier heats up to 65°C or 150 degrees Fahrenheit, which is a little too hot to hold but it is enough power to cover an area of up to 100 cubic feet. This Lockdown model comes with 12" rod, but is available also in 18", 24" and 36" long models. The electric GoldenRod Original dehumidifier is shipped with the six-foot cord and an attached plug, so you only have to stick the wire through the hole on the safe, reassemble with a plug, and connect to the power source. Since this rod heats up to high temperatures, it might get too hot to touch at times, so it might be safer to place them away from flammable objects as well as ammunition. Being an incredibly understated piece of equipment, there are many gun safes, especially older designs, without lights or with poor lighting. Thankfully, today we can easily see the contents of a safe using aftermarket interior lights. The modern LED lights are a breeze to install using velcro or adhesive to attach to the perimeter of your safe. As for the power, you can choose between an electrically powered light or a battery operated unit. Most accessory lights have a manual switch or a door switch, but some lights also have an optional motion detection setting. On the other hand, the manual switch saves more power than the motion detector lighting options. Though we are usually looking for some options to brighten up the interior of our safe, we should not forget that there are also exterior lights. These attach right over the dial allowing us to open the gun vault at night without turning on a lot of lights. As well as other suggested accessories, the gun-cabinet interior lighting system is a very useful add-on. 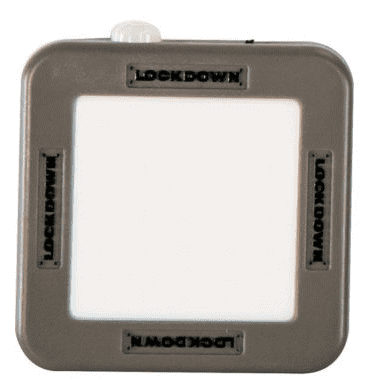 Browning Safe’s LED Light Kit model 164112 comes with a motion sensor that turns itself on when you open the door of your vault and automatically shuts itself off after 30 or 60 seconds with no motion or on closing the door, depending on your preferred setting. 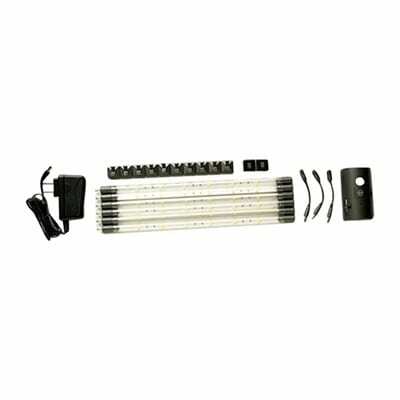 The Browning Led Light kit contains a motion sensor module; six LED light tubes with six LEDs per tube, three connectors, and mounting clips with hook and loop tape. The Browning light kit also includes an A/C adapter, that means your gun safe must have an internal power outlet to use AC power. Although this aftermarket lighting solution, with its expandable, linear design offers the ability to rotate the light strips to provide the light where needed, you shouldn't expect a lot of flexibility with the arrangement of the lights since there are not enough connectors to adequately set up the lights the way you want. If your gun safe comes without power cord holes, you should consider wireless, battery powered gun safe lights. These battery powered LED lights have so much potential because they have a lot of features such as an auto on/off sensor with a timer, multiple mounting options, and the standard 3 'AAA' batteries that provide six hours of continuous runtime per light. You can mount the light via magnets or screws, but you should know that the magnets aren't strong enough to hold the light fixed to the safe wall with batteries installed. You can also choose between two models: one unit with 75 LED and 95 lumens or two smaller units with 25 LED and 70 lumens output. Gun safe magazine storage holders and racks allow you to store and organize your pistol or AR-15 magazines easily. Whether you keep your ammo magazines in a weapons room, ammo locker, or gun safe, the mag holders will make them readily available for access in a personal defense situation or at range time. Additionally, you should find out if the particular model requires a metal surface (magnet mount), screws, or any other hardware for mounting. 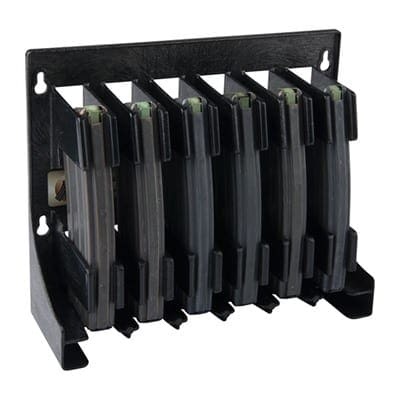 If you want quick mag retrieval, the Mag Storage Solutions AR-15 Mag Holder is an excellent storage method, and it will also protect your mags from accidental fall and feed lip damage. The AR-15 Mag Holder is constructed of injection molded ABS plastic for the right amount of rigidity and is compatible with over 60 brands of 30-round only, AR-15 mags. Featuring reinforced keyholes for screw mounting, it is primarily intended for installation inside of your gun safe, but you also have the possibility to mount this Mag Holder to the outside of your vault using the optional Neodymium Magnet Kit. This AR-15 Mag Holder isn’t cheap, so it’s understandable that some customers have complained that it does not come with any mounting hardware (no screws, hangers, or magnets are included). Keeper MG is already known for their gun holders, a single piece metal design based on powerful, high-grade N35 neodymium magnets. 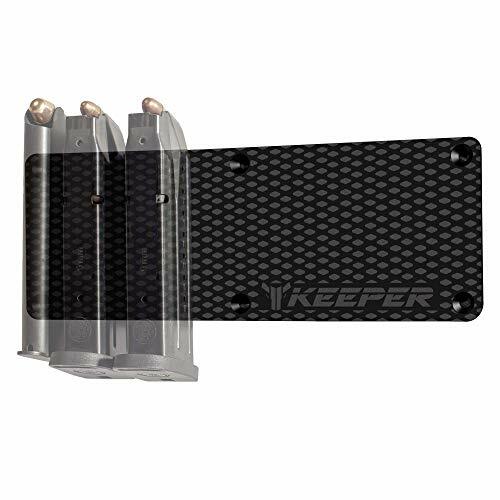 The new Keeper Magazine Holder is designed in the same style and quality as their Magnetic Gun Mount but with smaller dimensions (8.7" x 3.1" x 0.3” ) for a sleek and flexible way to secure your magazines. Featuring three strong magnets on the backside, you can mount this screwless magazine holder at any metal surface in your gun safe. However, it also comes with the flush screw holes and mounting screws so that you can mount it on any other surface. Although the magnets are relatively strong, this holder will not hold a handgun, but it will hold up to seven loaded, full-metal magazines. It is an expensive holder but offers an unobtrusive mount and is the perfect fit for any location. While some people call them weapon safe coordinators, these incredibly useful accessories are better known as door panel organizers. Using a door organizer in your gun vault or gun cabinet will maximize the space inside of your safe and utilize it even more adequately. The best firearm safe door organizers are highly customizable offering plenty of pockets to keep and organize your valuables. These panels are available for any kind of gun safe but are primarily intended for use in gun vaults configured for the storage of long firearms. 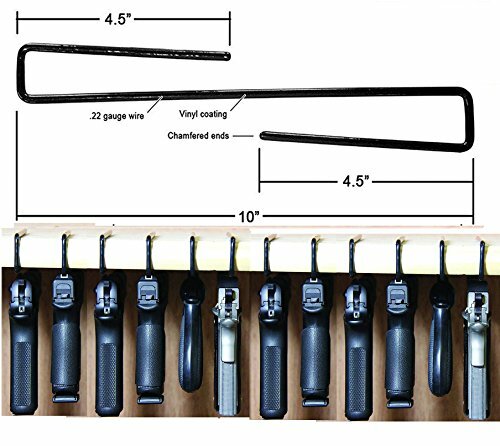 Gun safe door panel organizers hang on the inside of your gun safe's door and they are easy to install using generic hangers that can be used on any safe. SPIKA is a renowned brand in the world of professional shooting accessories and hunting products. They offer universal gun safe door organizers in several different sizes ranging from 12 to 19 pockets, along with some room to hold additional long guns. 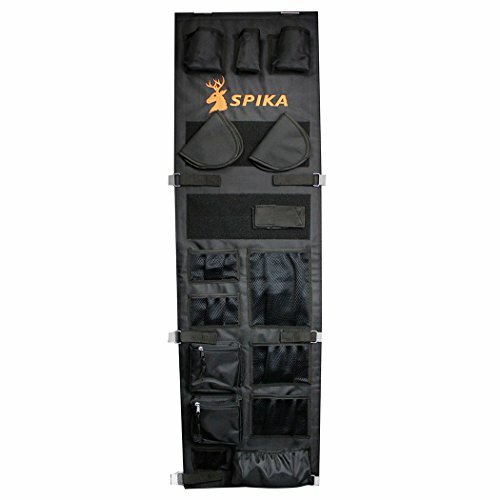 The Spika Small Safe Door Panel Organizer measures 14×48 inches and features a total of 12 pockets. Several pistols can be saved in Spika door organizer but you should pay attention to the maximum suggested weight by the manufacturer. Additionally, it can hold one long gun but it may block the use of some other pockets. The versatile Spika Door Organizer is a little costly when compared with other models, but it comes with two-sizes of installation hardware and uses six clips, two on the top and two on each side, to attach. Using rods and pistol hangers will allow you to store more guns in less space. While the rifle rods help you to increase the storage capacity of your safe by 50% just by storing things more efficiently, the handgun hangers will enable you to claim that unused space underneath the shelf. Actually, pistol hangers come in two types, one that can hold two handguns over and below a shelf and variant that hangs under a shelf. Both versions are an elegant way to store your sidearms with an overall length less than ten inches using 5/8 to one-inch-thick shelves in gun safes, cabinets, or bed frames. The AmeriGun Club is a typical barrel gun hanger that positions your handguns under a shelf and above your long guns using a vinyl-coated rod. It will maximize shelf space giving your firearms the “floating gun” look. The AmeriGun Club Handgun Hangers are shipped in with 12 hangers in the package, but while this “KISS” principle works well with smaller handguns, it may bend with heavier revolvers or a full-sized 9mm attached. AmeriGun utilizes coated metal rods that vaguely resemble a large square ’S” and can be used on 22 caliber handguns and larger. This handgun hanger will fit sidearms up to 10″ in overall length and shelves 5/8″–1″ thick and 10″ or deeper shelves. Fire and theft aren’t the only threats our weapons face. Until now, most of the readers have found that excessive humidity remains one of the biggest threats to your gun safe's interior, firearms, and other valuable possessions. Maybe you already know that museums keep their exhibits at a controlled temperature of 70°F and relative humidity of just under 50%. For gun safes, many would agree that a relative humidity of under 60% and temperature of 70°F would be perfect to keep your guns, ammo, and valuables in top condition. To ensure a controlled temperature and humidity, you have likely installed a dehumidifier of some sort. However, in order to monitor gun storage conditions, you will need to purchase the right gun safe hygrometer to enable round-the-clock monitoring of the conditions in your vault. The AcuRite Pro Accuracy Indoor Temperature and Humidity Monitor with Alarms is a battery-powered unit that will provide you with reliable information about the indoor environment in your gun vault. The AcuRite measures ambient room conditions like the temperature and humidity and can alert you of undesirable indoor conditions within your safe, in case of significant deviation of temperature or humidity. 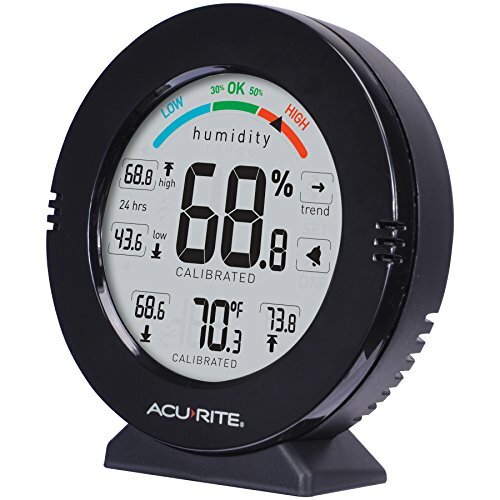 The AcuRite device measures indoor temperature and relative humidity from -4 to 158 degrees F (-20 to 70°C) and 1-99% RH. The AcuRite will give you up-to-date information as it measures conditions every ten seconds and shows data on the easy-to-read digital display. This compact and easy to use gun safe hygrometer comes with a variety of mounting options such as a magnetic back mount, wall-mountable backside, or simply tabletop placement. As we found in the above context, a firearm storage safe on its own usually doesn’t store your guns as efficiently as you had hoped. A gun vault does not necessarily guarantee your weapons and other valuables stored inside it are safe against moisture or fire. Over time, your constant collecting can cause guns and ammo to become more crowded in your firearm cabinet than you would like. Hence, these essential gun safe accessories keep your arsenal organized within your gun cabinet and at the same time enable you to store even more weapons than you ever thought possible. Actually, with clever use of the gun safe accessories, the arrangement opportunities seem infinite. Additionally, these accessories will help you to store guns more efficiently, meaning it will be very easy to recover weapons very quickly when a need arises.